Learn everything you need to know about your 7 week old baby. Track important developments and milestones such as talking, walking, growth, memory & more. Feed her 30-60 minutes before bedtime. Babies who doze off right after eating might not sleep as well as those who've had a little time to digest. Start a bedtime routine. Taking a warm bath, reading a board book together, singing a song, and blowing a good-night kiss not only give her a sweet way to spend time with you before she drifts off, but they cue her in to the fact that it's time to settle down and start sleeping. Plus, babies are creatures of habit, so having a reliable routine helps her know what's coming next -- and that's super relaxing. If she wakes in the night but it's not time to feed her, try comforting her without picking her up. When you rub her back or softly sing to her, she'll know you're there, but she'll build the ability to settle down on her own. 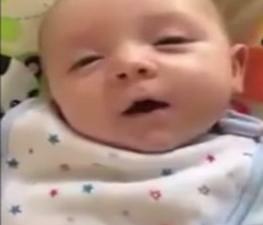 Your baby's senses are getting increasingly keen. If you walk into the room and call to her, she might look toward you, which means that she's coordinating sight and sound, an important cognitive milestone. Her eyesight is also getting sharper. Want to check? Hold a toy in front of her face, then slowly move it to the right, then to the left. Her eyes will follow it, an ability called tracking that means she's on track developmentally. In the first three months about half of all babies develop cradle cap, yellow or brown dandruff like flakes that form on the scalp. Though it shouldn't bother her at all, it looks kind of yucky, so get rid of it by combing or brushing her head (even if she has no hair to speak of), which can help stimulate the oil glands in her scalp to heal the dry patches. In most cases cradle cap clears up on its own, but if it looks like it's getting worse, call your pediatrician. Some babies also get eczema, a skin disorder that can be triggered by sensitivity to something in your breast milk (say, a food you ate) or a change in formula. It might also be caused by a new laundry detergent, soap, or lotion. Among kids who get eczema, about 60 percent will experience symptoms before they turn 1. The condition appears as dry, red, scaly patches that often show up first on the face or in skin creases, then spread to other parts of the body. Your baby might try to scratch her skin, and you might notice that it's flaky or even blistery in spots. It can be irritating, so your pediatrician might recommend bathing your baby less often (to prevent her delicate skin from drying out any further) and applying a light, fragrance-free lotion several times a day. If it's a severe case, your baby might need a prescription cortisone cream -- or antibiotics if there are signs of infection. By now you're probably getting out with your baby a bit more -- which means toting a diaper bag packed with what might seem like her entire nursery. But if you're just running an errand or two, you don't need to bring quite as much as you think. Tote a couple diapers and wipes, a blanket, a pacifier (if she uses one), a just-in-case change of clothes, burp cloths, and a bottle with formula if you're not breastfeeding. Don't forget some resealable plastic bags for stashing dirty diapers or clothes. The one thing you don't need to go nuts with: lots of toys. Odds are she'll be so enamored of her new and different surroundings she won't need much else to entertain her, and your load will be vastly lightened with just one or two favorites. One way to make day trips more exciting for your little one: Keep the chatter going. At the grocery store, explain each food you pick up and drop in the cart. Point out cars, trees, and buildings while you're out and about. Keep her interest by saying her name a lot during your chats. It might seem a little nutty -- and you'll feel a bit like you're talking to yourself -- but by giving your baby a running commentary of what you're doing throughout the day, you'll do wonders for her vocabulary. By showing your baby's love, she will develop a sense of self-value and enhance her emotional skills.